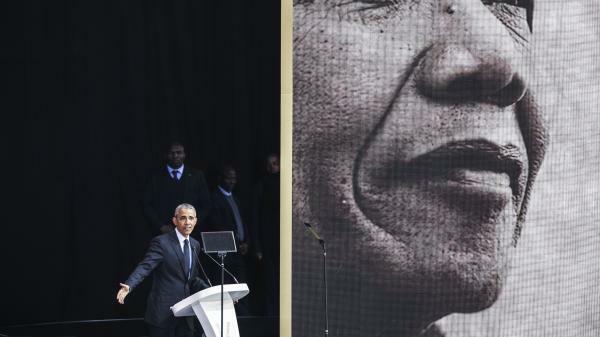 Former President Barack Obama gave a speech in South Africa today honoring the legacy of Nelson Mandela. It's one of Obama's most high-profile appearances since he left the White House 18 months ago. And it offered a kind of preview of what we might hear from the former president this fall when Obama is expected to campaign for his fellow Democrats running in the midterm elections. NPR's Scott Horsley reports. SCOTT HORSLEY, BYLINE: Some 14,000 South Africans gathered in a Johannesburg cricket stadium on the eve of what would have been Mandela's 100th birthday. Obama, who calls Mandela the inspiration for his own political activism, recalled the day in 1990 when the anti-apartheid leader was released after 27 years in prison. The Berlin Wall had come down just three months earlier, and Obama said the world seemed full of hope for the spread of democracy, prosperity and freedom. BARACK OBAMA: And all that progress is real. It has been broad, and it has been deep, and it all happened in what by the standards of human history was nothing more than a blink of an eye. HORSLEY: But Obama says globalization has also brought rising inequality and insecurity, ultimately triggering a political backlash that caught many observers by surprise. OBAMA: And just as people spoke about the triumph of democracy in the '90s, now you're hearing people talk about the end of democracy and the triumph of tribalism and the strong man. HORSLEY: Obama urged his audience not to surrender to that kind of cynicism. He held up Mandela as an example of perseverance in the face of adversity. OBAMA: We've been through darker times. We've been in lower valleys. HORSLEY: Obama has generally avoided the spotlight since leaving office last year, but he is expected to campaign for his fellow Democrats this fall. Progressives, he says, have a good story to tell, but they have to make their case to people who feel genuinely uneasy about the changes around them. And they can't talk only to themselves. OBAMA: Democracy demands that we're able also to get inside the reality of people who are different than us so we can understand their point of view. Maybe we can change their minds, but maybe they'll change ours. HORSLEY: Obama did not mention President Trump by name, but he did criticize politicians who, in his words, just make stuff up. And while Trump told a British newspaper last week that mass immigration is changing the culture of Europe in a negative way, Obama argued for a more inclusive culture, one that's tolerant, dynamic and multiracial. HORSLEY: As he often did when he was president, Obama will host a town hall meeting in Johannesburg tomorrow for some 200 young African leaders. He quoted Mandela, who said young people are capable when aroused of bringing down the towers of oppression and raising the banners of freedom. Obama added, now's a good time to be aroused. Scott Horsley, NPR News, Washington. Transcript provided by NPR, Copyright NPR.